Why Do I Need My Own List? You might wonder why the heck you should care about this. Why do you even need your own mailing list? Maybe you have a big audience on Youtube or Facebook, and they tell your followers for you about new things you post. Isn’t that great?! Maybe. When you rely on a “platform” (like Facebook or Youtube) to notify your “subscribers,” you don’t own the list of your own subscribers! If for any reason you lose access to your account, you lose access to your subscribers too: your business is at their mercy. People lose access to their accounts on Youtube, Facebook, and other such platforms all the time: Google it for some real horror stories. If your business relies on someone else’s platform, it’s not really “your business” at all — it’s theirs. They don’t care if your rent is due. If you violate their rules, it’s over. You’re done. So again, it that really “your business,” or theirs? Sure, you can probably pick up your blog posts or videos and re-publish them somewhere else, but what about your audience? Will they know where you went, and how to keep seeing your stuff? How long did it take you to build that audience in the first place? Do you really want to start over? You may have noticed, for instance, that Facebook shows you have a big group who “Like” you, but how many actually see anything you post on Facebook? A tiny fraction of your audience — just a few percent of your hard-won followers! Facebook is happy to show your post to more …if you pay them. They call it “Boosting” your post. I call it paying them to show things to the audience you created. And they can do that because you’ve built your business on their platform. You only can call an audience yours if you can reliably contact them without buying an ad! 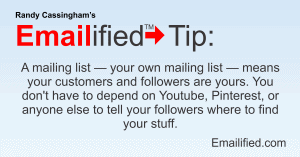 A mailing list — your own mailing list — means your customers and followers are yours. You don’t have to depend on Youtube, Pinterest, or anyone else to tell your followers where to find your stuff. Your own mailing list makes that possible. It’s an asset for your business. First Things First: What IS an Email List?